I have hair and skin that dries out significantly, then explodes into an oily mess if I use body products that contain sulfates. Artificial fragrances tend to make me itchy as well, so I try to stick to products that include as little nonsense as possible. Bar soaps usually contain fewer ingredients, and often times fewer ingredients equals less irritation. People are attracted to liquid body washes because they tend to have more lather (which they associate with “clean”—not necessarily the case) and the scent tends to last longer because the perfumes used have more staying power, but are also more irritating to the skin. Sodium Lauryl Sulfate (SLS) as well as other sulfates are what are responsible for the lather in your body wash, shampoo, and even toothpaste. Unfortunately for those who are sensitive, they can also be harsh and drying to the skin. Bar soap is nice in that it doesn’t generally contain SLS or any other sulfates to produce lather. The problem with most bar soaps, however, is the “tightness” feeling you get from the strength of the soap. 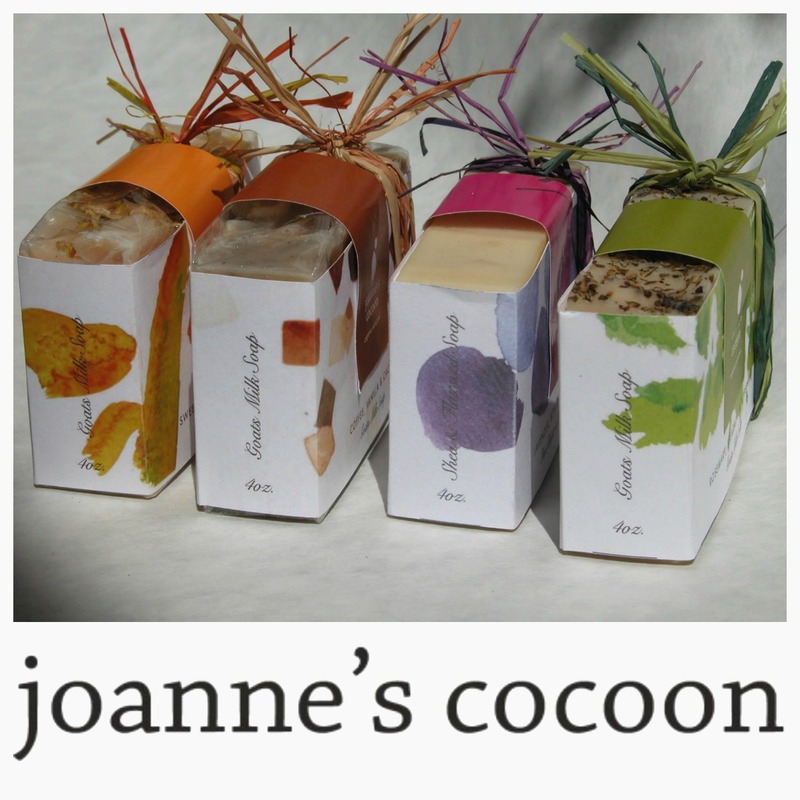 I was pleasantly surprised to find that the soap from Joanne’s Cocoon has none of those issues. I received a generous supply of 14 bars of soap to try out, two of each scent. So for this, I gave some to my mom to try, who does not have explosively sensitive skin, but who is somewhat picky in her scent preferences. One thing in particular that I noticed about all of the soaps is that they last, without softening into a squishy mass that splats and goes down the drain if you accidentally step on it (oddly specific, yes, but this is a thing that I have experienced). 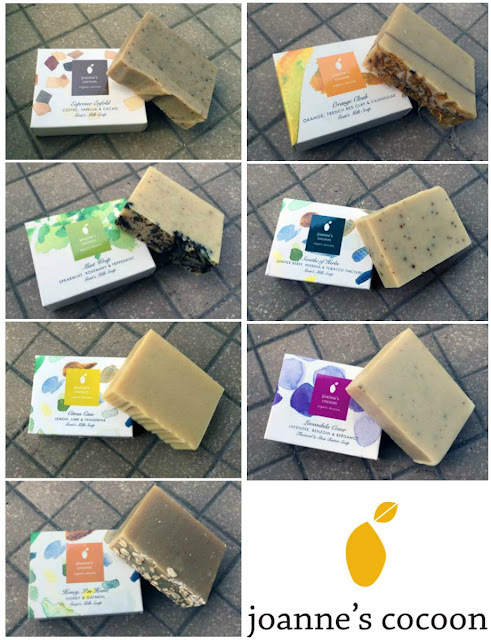 All of the soaps are organic, made with goat’s milk, natural essential oils and tinctures. Most of them actually contain bits of plant matter in them as well, which I think is extremely cool. 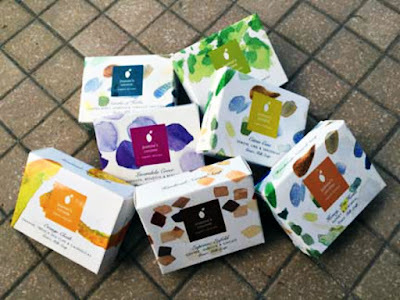 I used each with a bath puff and they lathered well without having to go back for more, and they didn’t have that drying, tight feeling that most bar soaps have. Each bar has it's own personality and purpose. Espresso Enfold— an exfoliating bar with coffee, vanilla, and cacao: This one smells like creamy coffee and the most like food. I’m not a big fan of dessert-type scents as a personal preference, but would be good for someone who likes that sort of thing. Orange Cloak—Orange, French red clay, calendula: Fresh orange scent with a slight hint of cloves. Calendula leaves are pressed into the soap. These ingredients work together to encourage skin elasticity and hydration, making for an excellent anti-aging soap. Mint Wrap—Spearmint, rosemary, peppermint: In the words of my mom, “this smells like chewing gum”. Astringent, minty and kind of tingly, but not for everyone. Dried mint leaves are pressed into the soap. 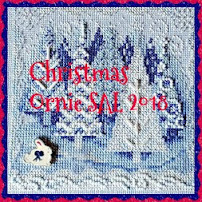 Swathe of Herbs –Patchouli, juniper berry, and tobacco tincture: This one probably sounds the weirdest, but is a great combination. I suppose this could be considered the most “rustic” of all of the scents, but all temper each other. Definitely one of my favorites, this bar is excellent for soothing combination to oily skin. Citrus Case—Lemon, lime, and tangerine: This is mom’s favorite. Light and refreshing, it’s supposed to be the skin-clearing bar. I haven’t used it long enough to determine how well it clears the skin, but it smells great. Lavendula Cover—Lavender, Benzoin, and bergamot: Mom doesn’t like the scent of lavender as a personal preference, too English-teacher-old-ladyish for her. I like it the best, though, and the bergamot gives it a floral-but-not-too-sweet balance. This soap is designed to treat dry skin and excema. 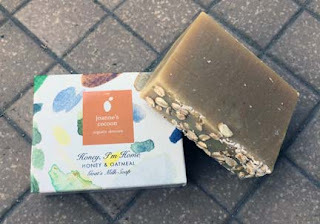 Honey, I’m Home—Honey and Oatmeal: This one doesn’t have much of a scent, but was noticeably more moisturizing than the others. Actual oats are pressed into the soap. This would probably be good for someone with skin irritation or dry skin issues. The scents of each of the bars are great, but don’t have staying power for very long after the shower. Such is the nature of natural scents, however. You get to enjoy them in the bath and then they’re done. If you want something that will stay in your pores for any length of time, you’re going to have to buy a liquid detergent, and your skin doesn't want you to do that. 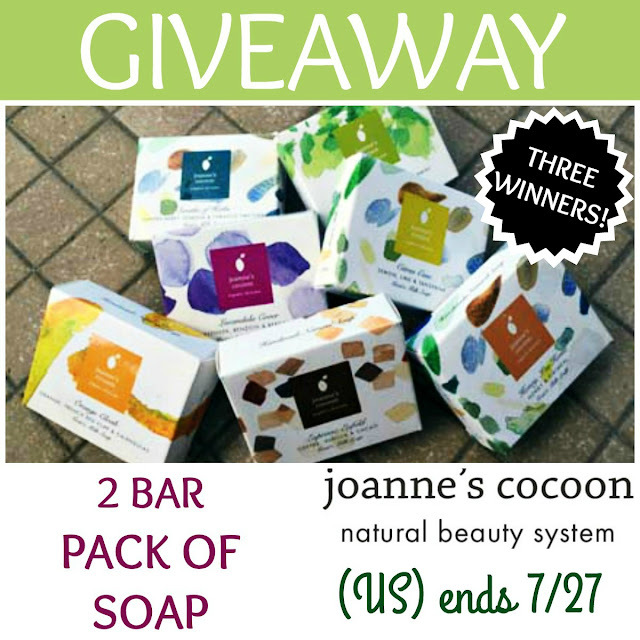 Joanne’s Cocoon has generously offered to give away one (1) two-pack of your choice to three lucky readers in the US. 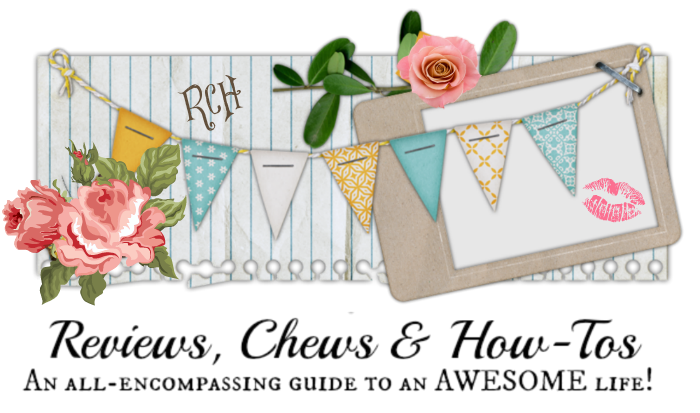 Keep reading to see how you can enter to win! To enter the giveaway, you must leave a comment in this entry as instructed by the Giveaway Tools Entry Form below. This will open up additional optional entries to increase your odds of winning. 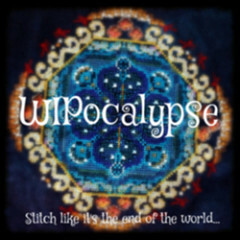 This giveaway is open to US RESIDENTS ONLY and will end just before midnight ET on 7/27. The winners will be notified by email within 24 hours after the end of the giveaway. In order to claim the giveaway prize, the winner will need to respond within 24 hours of notification, or an alternate winner will be selected. Once the winners have responded and confirmed, their first names will be posted on our Giveaways page. All of the soaps sounds really nice, but I'd especially like to try the Exfoliating/Anti-Aging 2-pack. (I'd also LOVE to try Swathe of Herbs - but I have dry skin, not oily, so that may not be for me). I would love the Enrich/Even Tone duo! Thank you for the wonderful giveaway. I would like the Enrich/Even Tone bar soap 2 pack. Enrich/Even Tone -the catch phrase "Honey, I'm Home" caught my eye. I would try the mint wrap. Especially for the summer months. i would like to try the refresh rejuvenate two pack! Orange essential oil brightens up dull skin and helps to smoothen while curing acne and dermatitis. Orange also quickly relieves inflammations, works as an antidepressant, antiseptic, and a sedative. Scientific research shows that Vitamin C found in orange essential oil increases blood flow to the skin and encourages collagen production and skin elasticity. I'd like the anti aging. I would definitely pick Citrus Case. I would choose the Enrich/Even Tone set. I love lavender scent! These soaps look great! I would try Refresh/Rejuvenate. Wow....these soaps look amazing. I would especially love to try the refresh / rejuvenate soap duo. I like the description of the mint having a cooling and de-stressing effect. I could sure use that. I would like to try the Exfoliate/Anti-aging soap duo. I would pick the Citrus Case and Honey I'm Home if I won. All these soap bars look nice and pretty.It is good to know such brands which don't contain SLS in their products. I would select the Enrich/Even Tone duo! I love that everything is organic! The Enrich/Even Tone set looks great. Both of those scents look great. I would love to try the Swathe of Herbs soap bar. I'd give the Exfoliate/Anti-aging a try. Looks appealing! I learned that Joannes soaps are made Using organic fruits and herbs, we set out to create a chemical free soap that's perfect for all skin types. I would get the Refresh/Rejuvenate soap duo. I want something to wake me up in the mornings! All of these soaps sound great! I like Honey I'm Home. I like the refresh and rejuvenate. But all of them sound great! I'm a major coffee lover, so I'm leaning towards the espresso enfold... But each one sounds so great, I can't decide which I would get. I want to try them all! I'd pick the Enrich/Even tone duo pack for myself. I really love the scent of lavender and I think the "honey I'm home" would also smell lovely! These all look amazing, but I really love the mint! Thanks for hosting! I'd like to try the Exfoliate/Anti-aging bars! I like how her site is laid out, very simple. I'd like the Lavandula Cover as I'm prone to dry skin, and she adds shea butter into that recipe. It sounds like I need the Refresh/Rejuvenate pack. I am acne prone AND we've been doing a lot of work around the farm and getting sweaty and gross. I like feeling rejuvenated and extra clean afterwards! I love nicely made soaps, especially with herbs, flowers and citrus. Yum! And when they look pretty too, that's a huge bonus. The more that I become aware and cautious what I put in my body I am beginning to become aware of what I'm putting on it too. Definitely going to check these out! Thanks! I'd like the exfoliate/anti-aging soap. 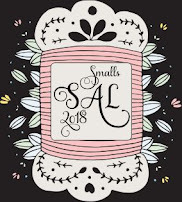 I get sensitive to sls when I'm pregnant and luckily go back to normal when I'm not. It's no fun. My hands often bleed! I'd like to try a gentle soap like this. Great review. I am thinking that I need to move away from Scented Body Wash to something with less ingredients. These soaps sound great. Thanks for linking with #overthemoon! I really like honey I'm home because of the oatmeal and the honey in the goat milk. What a soothing mix. I'd like to try the citrus. I would love to try the Refresh/ Rejuvenate soap. The Espresso Enfold Soap sounds nice. The one soap I really want to try is "Mint Wrap" because it treats oily/acne prone skin! For the two pack; I think I'd have to select the Refresh / Rejuvenate (Mint Wrap & Swathe of Herbs). If I could select any soap that i wanted, I'd definitely go with the Orange Cloak and Citrus Case. I'd love to try the Refresh/Rejuvenate pack! sounds the best! They all would be a treat though! They have something that's called "Cloak soaps" that help with sun prevention.